Notes: In the infancy of the town, the duties of [the Health Department]] were performed by the City Commissioners, who passed an ordinance requiring the citizens to remove nuisances from before their houses, and appointed one of their members, Dr. Wm. Lyon, to see it enforced, 1750. Notes: In 1792, yellow fever occurring, the citizens elected a Committee of Health, to enforce sanitary measures, and Gov. Lee appointed two quarantine physicians for the port of Baltimore, one for land and one for sea, and in 1794 a third, to aid the citizens in enforcing quarantine. Notes: The Board is to be composed of five commissioners, two of whom are to be taken from east of Jone’s Falls. The city is to be divided into five districts; commissioners to meet weekly; the Superintendents of Streets are to be subordinated to the orders of the board, in removing nuisances; the physicians of the city are invited to give their advise to the board; they are empowered to establish a cordon around any infected locality of the city, which no one is allowed to pass except under the certificate of a physician; they are to appoint a Health Officer of the port, and adopt rules for the government of the Quarantine Hospital. Each Com. to receive a salary of $400 per an. Notes: The board to be composed of four members, two from each side of Jones’ Falls, and a clerk, who is to receive $100. Notes: Quarantine suspended by the board. Notes: Powers of City Commissioners and Commissioners of Health united in the latter. The Health Dep. not to cost over $1200 per annum. Health officer’s salary to be $800. For cleaning streets, $5500; each Com. $600, clerk $600. Both latter allowed $150 more for extra services. Notes: $1200 to H. Dep., each Com. $600, clerk $600. Notes: Board to be composed of five members and called Commissioners of City of Baltimore, and when acting in capacity of Health Board, to head their documents “Health Office.” Each Com. to receive $800, clerk $800, Health Officer $1000. Notes: The Board to be composed of three Commissioners, one Consulting Physician and the Health Officer. Salary of Com. $600 each, of Cons. Phys. $600, Sec. $100. To divide city in three districts. Meet regularly twice annually, and oftener, if called together by Mayor, or physicians. Superintendents of Streets under their control. Notes: Council, at suggestion of Dr. James Smtih, appoint five physicians as a special Board of Health to organize measures to control the small-pox, then epidemic; they are authorized to divide the city into six districts, and appoint a vaccine physician to each, at a salary of $200. The vaccine physician to vaccinate all who are unprotected, and report those refusing, and those who have had the smallpox, and the number vaccinated, to Mayor and Council. Notes: Appropriation to H. Dept., $4000. Notes: City to be divided into five (5) districts for street cleaning purposes, and a superintendent appointed to each. Notes: Six Vaccine Physicians to be appointed by the city — one to each district at a salary of $100. Notes: The following hospitals have ambulances for the conveyance of sick persons to the hospital named in the title:The City Hospital, Calvert and Saratoga Sts. Johns Hopkins Hospital, Broadway and McElderry St. 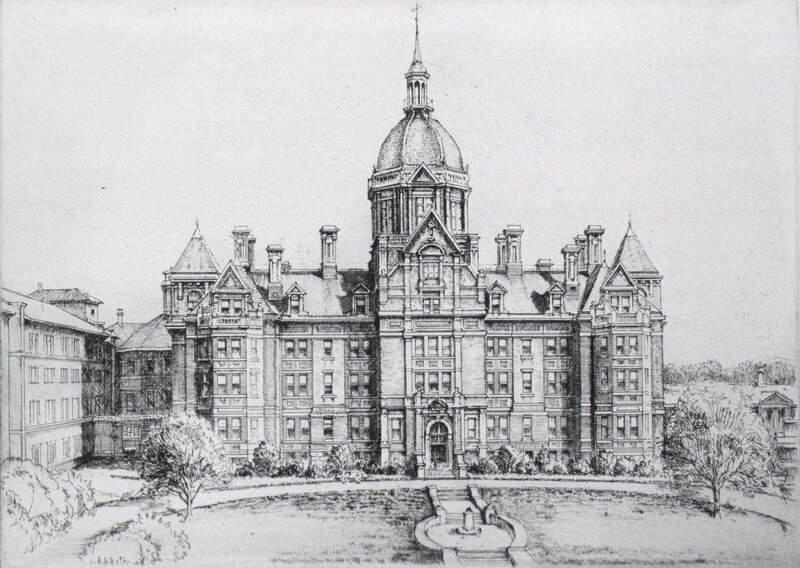 The Maryland General Hospital, Linden Ave. and Madison St. The Maryland University Hospital, Greene and Lombard Sts. St. Joseph’s Hospital, Caroline and Hoffman Sts. The Health Department, City Hall Annex, has a ambulance to convey cases of contagious disease to the Quarantine Hospital. The Supervisors of City Charities have contracted with the following hospitals for the conveyance of city patients: Maryland General, Maryland University, City Hospital, St. Joseph’s, and Homeopathic. United States Marine Hospital Service has an ambulance which conveys sick sailors to the hospital. Title: Johns Hopkins Hospital, Baltimore E.D. Roth. Collection: Images from the History of Medicine (NLM) Copyright: The National Library of Medicine believes this item to be in the public domain. Site researched and developed by Nancy B. Sheads. Copyright ©2009.